They taste like a tropical vacation! I liked them with butter and apricot jam. My kids were hollering for pineapple, mango, and some toasted nuts but I gave them what I had on hand, maple syrup and whipped cream (poor, poor deprived children). I cut this recipe out of a Bon Appetit magazine in December, 2013 but didn’t make them until July 2014. I’m glad I don’t clear my refrigerator of assorted clippings and notes and pictures all that often, and I am glad I saved this recipe for seven months! The note above the recipe states the recipe is from Elmwood Cafe in Berkeley. I wonder what they serve them with… You’ll need some coconut oil for this recipe. I don’t think it affects the taste much, but I think it adds to the delightful crunch. I did make one change to the recipe, I reduced the amount of toasted coconut. 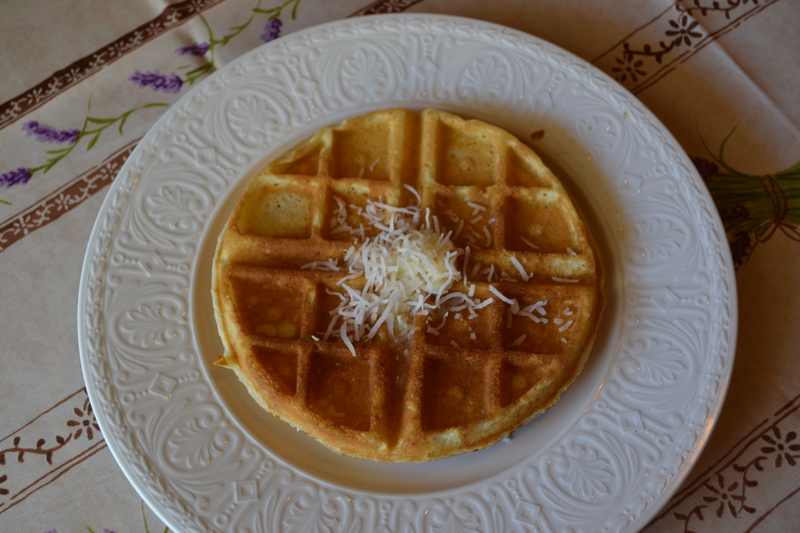 Only ¾ cup of toasted coconut is incorporated into the batter, but the recipe stated to toast 1 ½ cups, using the extra ¾ to sprinkle on top of the cooked waffles, that’s way too much coconut for sprinkling, an extra ¼ cup will do you. I toasted the coconut and mixed up the dry ingredients before I went to bed, which made Sunday morning a bit easier. I just had to stir in the eggs, milk, and coconut oil and heat up the waffle iron. The batter made 7 large, round waffles (which leaves some for us to throw in the toaster tomorrow morning). Word of advice, if you like waffles, and want to enjoy them on a regular basis, get two waffle irons. The horrible thing about waffles is that it’s hard to get everyone a hot waffle at the same time. Two waffles irons solves this problem–unless you have a really large family and need three waffle irons… It goes without saying that you have to like coconut (and the Hawaiian mojo) to like these waffles. But who doesn’t like coconut…, or Hawaii!? Toasted Coconut Waffles, take me awayyyyy. . . . The original recipe said to preheat oven to 400°F, toast coconut on a rimmed baking sheet until golden brown, 2 minutes. then let cool. I find it easier to toast the coconut in a dry frying pan over medium heat. Just keep stirring and then watch closely. Once the coconut is a nice golden brown remove it from the pan and let cool on a plate. Whisk flour, cornstarch, salt, baking powder, and baking soda in a large bowl (I did this the night before, covered, and left on counter). Whisk eggs, buttermilk, milk, oil, and sugar in a medium bowl. Whisk buttermilk mixture into dry ingredients (do not over mix). 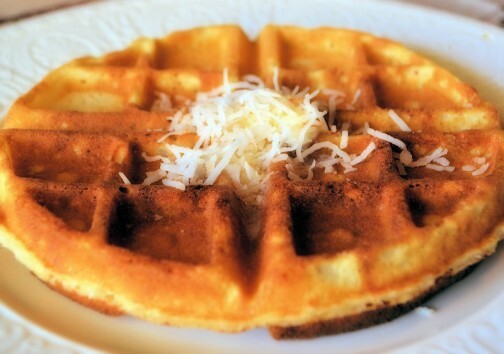 Mix in ¾ cup coconut; set aside remaining ¼ cup coconut for sprinkling on waffles. Heat a waffle iron until very hot. Ladle approx 2/3 cup of batter onto hot waffle iron, close lid, and cook waffles until golden brown (each waffle iron is different, but usually 4-6 minutes). Serve topped with your choice of toppings: butter, syrup, apricot/pineapple jam, diced fresh bananas/mango/pineapple, toasted pecans, whipped cream and reserved coconut. I am so excited about this recipe! It’s a paradigm shift recipe! It’s not a recipe in the true sense of the word, it’s more of a road map to a particular destination. A road map allows for more flexibility than a recipe, a road map allows the cook to make adjustments based upon personal preferences, taste, time, and what’s in the pantry. I think most people have a road map for a few good dishes. I have a road map for spaghetti sauce, chicken soup, stir-fry and hamburgers. You might have a road map for meatloaf, burritos and rice bowls. Most people have road maps for sandwiches and salads. A road map means there are guidelines, easy ones, usually ones that can be memorized, and that can always be adapted as the situation requires. So here it is, a guideline for a pot of beans, in the crockpot no less! Crockpot cooking is great for summer, the kitchen doesn’t get heated up, and a pot of beans pairs well with almost everything that can be BBQ’d. In the winter months, a bowl of beans with some cornbread or tortillas is almost the definition of comfort food. Another plus, crockpot cooking is fuss free, so toss everything in the pot and then go sit in the sun or shovel snow. Many thanks to Mark Bittman of the New York Times for this road map. Thank you, thank you, thank you!! 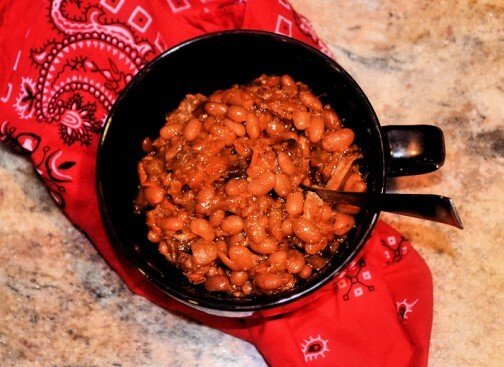 BTW…, for years I have been looking for a good baked beans recipe, so that’s what I make with this recipe: meaty, slightly sweet Boston-style beans. YUM! They go with everything and I have a serious love for leftover beans on toast (I’m English). My son mastered this recipe in one take and he makes killer spicy teriyaki beans with chicken. I can see others going for more of a Mexican style bean. What sort of beans do you like? Make them! 1 lb of dried beans, any kind, I like small white and pinquitos but black, pintos, garbanzos, kidney, or a combination of different kinds of beans can also be used. Don’t have a full pound of beans? Add in some split peas or lentils to make up the difference. Remember these are dried beans (about $1.25 for a pound bag) we are not using canned beans here (and there is no need to soak the beans first). 4 cups of liquid, any kind. Find a mixture that appeals to you. I start with a bottle of beer, then I add in about 1/4 cup of ketchup, 1/4 cup of Worcestershire sauce, 1/4 cup maple syrup, 1/4 cup of brown sugar and a squirt of mustard, using molasses instead of maple syrup and brown sugar would be good too. If my Dad were here I’d stir in 1/4 cup of bourbon. Then I add water, broth (any kind), or cold coffee to make the 4 cups (too much coffee will make the beans a bit bitter, so stick to less than 1 cup of cold coffee). My son adds BBQ sauce, sriracha, honey, teriyaki or soy sauce along with beer and coffee. Don’t like beer? Use some leftover wine. Don’t drink at all, stick to broth and water. Health nut? Stir in carrot juice and some of that green liquid you’re so fond of ! 1 lb meat, any kind, a bit more or a bit less is fine. I like beef, and I buy something on sale, beef shanks, top sirloin, stew meat, steak, anything. Throw in a pork chop or two, or some ground meat (brown it first and drain off the fat), chicken (with or without the bones, but boneless chicken does tend to get a bit overcooked), sausage, ham, cooked bacon…, or go for a combo. Sausage and chicken? Beef and bacon? Or leave out the meat all together if you’d rather. 2 lbs finely minced or grated veggies, any kind. I always add diced onion, grated carrots, and minced celery. Then I might add some shredded zucchini, turnip, cabbage, spinach or kale, whatever I have on hand. Throw in some potatoes. Lots of folk like bell peppers, dice some up and throw them in. Leeks are yummy. A few diced jalapenos would spice things up. Even canned pumpkin works. The only veggie I don’t add is tomatoes. I heard once that tomatoes interfere with the cooking process of dried beans, so I leave them out (I also don’t use tomato juice as a liquid, but I do stir in a bit of ketchup, and have had no problem with that). Put the dried beans in the bottom of the crock-pot. Get out a 4-cup measure. Combine your liquids. When you have 4 cups, pour it over the beans in the bottom of the crock-pot. On top of the beans and liquid, add the meat. I add the meat as is, then remove the fat and bones, and shred the meat after cooking. You can do the same, or you can add cubes of boneless, skinless meat. Finely mince, dice, or shred the veggies. Add the veggies on top of the meat. (The liquid will not cover the veggies, yet). With a spatula or a spoon, press on the ingredients to lightly pack. Put the lid on the slow cooker, plug it in, turn on high, and go out and play! If you are around, check the beans after a few hours. If the beans look dry add a bit more water, stock, beer, or wine (don’t stir, just pour it on top). Let beans cook for 6-8 hours. Turn off. After the beans have cooled for a bit, taste them. Needs more salt? More maple syrup? More heat? Add it now. If you added large hunks of meat with bones, remove bones and shred the meat. Remove the bay leaves, if you used them. If you want to add in extras, do it now. You could stir in some diced tomatoes now, if you’d like, they won’t do any harm at this point (let cook for an additional 30 minutes or so). Sometimes I stir cooked bacon at this point. You could stir in frozen corn, if you’d like. Adding chopped parsley, cilantro, or green onion makes the beans look pretty and brightens them up a bit for a pretty presentation. Remember, beans seem to taste better the day after they are made, so don’t be afraid of letting them rest in the refrigerator for a bit.